E-commerce software solutions like, Shopify and Magento, help businesses all over the world to sell their products and services online the easiest way possible. Not too long ago companies had to buy standalone E-commerce software products that needed a lot of setting up and an in house management and web development team. It was, and still can be very costly and time-consuming to establish a business in e-commerce. The advent of cloud computing and E-commerce software solutions has definitely helped. Entrepreneurs all over the world in making their dreams more than possible. An E-commerce platform has all the necessary business functions required to run your online shop. These functions improve collaboration, provide real-time data visibility, align operational processes, and more. Be it customer support, analytics & reporting, procurement, order & inventory management, content management, pricing & promotions or marketing. E-commerce shopping platforms make everything you need within easy reach, even for the most technically challenged. The first step is just to choose which among the many E-commerce platforms to use. Shopify and Magento are two of the most popular platforms out there. 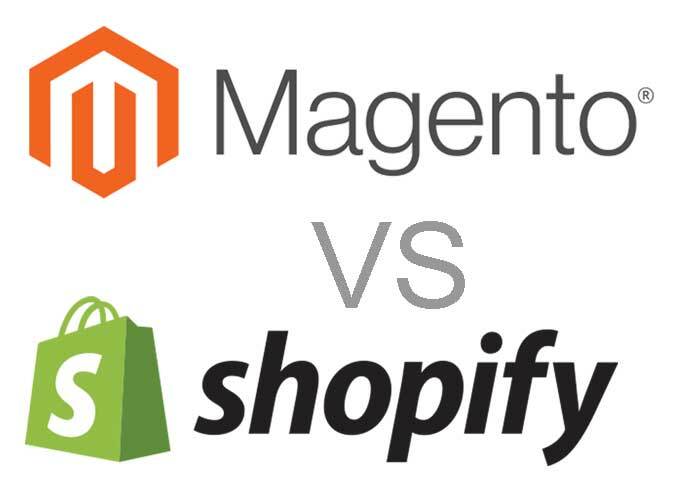 In this article we will compare Magento and Shopify to see which is the best. One of the key factors that users are looking for in an E-commerce platform is the technical knowledge required to run it. Some small businesses do not have the budget to hire a separate team of web developers to take care of the technicalities. So, it’s more than important for them to grab a platform that requires nothing too technical. The usability is always paramount. Shopify is definitely one of the most user-friendly platforms there is out there. All you have to do is choose a theme, fill in the sections with your own content, and then launch it for the world to see. Shopify also hosts your platform in the cloud, so there is no server to maintain. Adding a domain to your store is a simple case of entering your domain info. It’s never going to be rocket science with Shopify. The “Community Edition” of Magento is a form of E-commerce framework that’s downloaded and set up on your very own server infrastructure. Thus, you need a bit of technical know-how to pull this off. As long as you know how to navigate it, you can independently configure your your files and check how the actual website will display content to provide a good user experience. Depending on the infrastructure of your operations, you might need a full-time developer for this. This factor might not have a direct effect on your ROI, but surely it affects how you establish your branding. Picking a theme that exudes the exact message and branding you want to relay is utterly important. Shopify has free or cheap themes available, created by developers in the large Shopify community. However, if you want the best result, you might as well consider the premium themes that are usually priced at $140-$180. Overall, their stock themes are a bit nicer than Magento’s. Themes are also customizable, but you would still need a developer's expert help. However, Magento’s selection of themes is much bigger. Most of them are rather heavy E-commerce-store designs. They’re very traditional; the menu and navigation bars have strong features that lack the sense of subtlety that your customers might be looking for. SEO is important in any digital-related business. For your E-commerce shop, it’s also important that your marketer can easily customize the content of your website. It's important to update the pages regularly and follow the most relevant SEO practices that come around. Most E-commerce platforms out there actually have a good SEO functionality, and Shopify is just one of them. With Shopify, you’re free to edit the meta tags. Plus you can place inventory in an SEO-friendly way, add SEO tags, and more. To go the extra mile, you should take the time to edit the file structure of your website to make it easier for crawlers to understand your content. Since Magento is an open source solution and is not hosted in the cloud. You can tweak and customize your SEO methodologies in a better way. Magento allows you to get right into your site’s structure, so you can do more things like customizing how the links show for each inventory item. You can implement your onpage SEO optimization very easily with Magento. In our modern retail setting today, getting your inventory through multiple channels is highly essential. E-retailers should choose a platform that allows them to sell not just through your website. But also through marketplaces and major platforms like facebook, using one inventory database. Shopify is doing a great job at helping users sell across more channels. One of their most popular channels with respect to this is their Shopify Facebook App. Their point of sale solution is also really compelling and worth a look. You can be connected to your online and offline inventory. This is a great news for those smaller store chains. But do keep in mind that there’s a processing fee of around 2.9% per transaction. However, Shopify may limit you if you’re trying to sell across Etsy, Ebay, Amazon, etc. But you can still do so if you add some extensions. Shopify enables you to get integrated with many channels. However, since Magento is selling “customization”, you can link to whatever channel you deem best. You'll need to hire a team of developers to pull this off, though... unless you use magento's extensions. All E-commerce platforms have their own selling point, but they all share one thing in common... you need to add your inventory, aka upload your product details. To add and maintain inventory, both Magento and Shopify enable inventory import, user-friendly categorization, sub-categorization, variations, and also pricing differences. Shopify is exclusively designed to help small to medium-sized businesses thrive. Thus, they have developed a straightforward inventory interface. This gives you easy access to add a number of items. To import items using Shopify, you can make use of Shopify’s excel sheet. This can be filled out and uploaded within Shopify. It’s an industry-standard platform that’s super handy. Shopify also offers extensions for inventory. They provides various things, like club discounts, flash sales, and more. However, 100% customization is not achievable without developer assistance. Magento also has the basic inventory upload. However, they have an extra feature integrated. Magento can extend your inventory to match the inventory levels of the store’s location. This is a multi-channel feature at work. This requires more management and resources, but for those who feel the need to achieve this, you should consider Magento. With its total customization ability, you can employ third-party services to widen your network. Both Shopify and Magento provide integrations with card swipers and point of sale providers. They just differ a bit in the way you use them for in-store purchases. Shopify has been labelled as the “easiest way to create an online shop”. This is undoubtedly true. Shopify gets rid of the complications that most users hate. Since it’s not designed for large businesses, and the majority of the industry players are composed of small and medium-sized enterprises, Shopify is generally a useful platform for the majority. It does have its restrictions, which they will overcome in the future with their constant efforts to positively evolve. Your customers can check out with no fuss, and you can get the kind of shop that ooze usability and style in the eyes of your customers. Magento is designed for those who want to create an traditional online store and structure. Magento’s community edition enables you to integrate your in-store POS and manage the in-store purchases in your platform with a multi-channel capability. You can get more customization power if you go for the Enterprise edition. Although you can get to customize things the way you want it, do remember that it comes with a price; that is, you need to learn all of its technicalities. Or hire a Magento expert that can make things happen for you. Shopify, on the other hand, is made for you to set up your store in just a few clicks by yourself. Thousands of e-commerce websites are hacked every day. It’s highly important to safeguard your website and the precious data of your customers. Once you allow your customers details to get stolen, your brand will be in trouble. The E-commerce platform of your choice must have a powerful data encryption capability and other security measures that keep unwanted cyber attacks at bay. Shopify maintains their security well. Each Shopify Store has SSL encryption across all site pages... not just at the checkout. Shopify hosts your store for you. It’s a Level 1 PCI DSS compliant, so you security is tantamount to that of bank. Because of this, you can gain your customer’s trust. Nowadays HTTPS connections are a ranking factor to climb to the top of Google's SERPs. Since Magento is a “self-hosted” platform. Therefore it’s your responsibility to ensure that the data on your hosting is 100% secure. You need to buy the more expensive hosting plans to guarantee this. Also, if there are security breaches, the risks will be down to you. Shopify’s cheapest deal is their Basic package at $9 per month. You can go for this basic plan if you already have the site and would want to make use of Shopify’s buy now buttons or make a Facebook store. If you want more features, you can go for an upgrade. The community edition of Magento is free. However, you need the technical knowledge to make it work. If you don’t know the techie stuff, you would still have to spend money in hiring someone who does. The Enterprise Edition starts at $18,000 (hosting not included). It could get really expensive. Both Shopify and Magento charge payment process fees, but the fees will do eventually reduce with volume. Customer support is another factor that users must think about before plunging in. It’s one of the essential factors that make customers stay or leave. No matter how powerful the company’s features are, if the customer support is weak, the chances of conversion and retention will suffer. There are many ways to get in touch with Shopify’s staff. You can directly chat with a Shopify Guru (that’s how they call themselves), and wait for their immediate response. Their current waiting time is just 4 minutes. You can also drop them an email with your questions and concerns. The current response email time is around 29 hours. You may also opt to give them a call and talk to them over the phone for your queries. Their 24/7 support is a big hit. Magento doesn’t have a round-the-clock support, but they do have a downloadable customer support guide and downloadable support and policy guide on the website. For direct assistance, you can open a ticket or get help from the huge Magento community via their forums. Both Shopify and Magento are actually powerful in their own ways. Shopify is a fully managed and hosted service, so user-friendliness is its key advantage. Magento, on the other hand, (although free) would take time, effort, and money in purchasing the hosting and doing all the software setup and installation necessary. Tech-savvy people would find this manageable, but for the average end-users, Shopify might be the more practical choice. With the pros and cons laid out, I must say that Shopify wins not only for being useful to the majority but also with its powerful capabilities, optimum usability, maximum security, and reasonable price.